Keeping promises is easier said than done. Sometimes, breaking a promise is out of your control, like traffic making you late to a meeting or a bout of flu making it impossible to deliver on a deadline. But a promise is your word that you’ll be there for your client or colleague, so if you can’t make a meeting, or you’re running late, give him or her a call. This shows that their time is important to you, and can allow them to make the best use of the delay. If you simply cannot come through, try to arrange alternatives, so they don’t waste their time and effort. If you’re sick, most people would appreciate postponing a meeting, or conducting it as a phone call, anyway.. TIP: If you MUST reschedule or are running late on a deadline or meeting, give the courtesy of an actual phone call to reschedule immediately rather than sending an email or text message that they might miss. Doing the things you say you’ll do is the most important part of building a relationship of trust. “Under promise and over deliver” is a great mantra for business! Go above and beyond; finish what you said you would (and then some), and do it on time! Staying consistent is another bedrock in the foundation of building trust. People are creatures of habit, so when you are a constant in their life and in their business you add value without causing additional stress. They get to know you, trust you, and become used to relying on your contribution to their success. One specific way to do this is to schedule your meetings on a regularly recurring basis, like the first Tuesday of every month at 9 AM, and set an agenda that is consistent each time. That way, everyone knows exactly what to expect, and your interactions become a routine, beneficial part of their business. Nothing is better than achieving a goal! Since helping clients and colleagues achieve their own goals is what we aim to do anyways, why not make an effort to help each other celebrate? Whether you worked to achieve a goal together, achieved one of your own that affects your relationship, or heard that they accomplished one of their own, it’s a great time to call, send a card, or stop in to their office to celebrate together. Business relationships must offer a “mutual win.” You get a client; in return, they get a trusted service provider and professional confidant. Consulting with your clients and making recommendations is one of the most valuable parts of your relationship. If you make a recommendation that doesn’t ultimately work out for the best, take the blame for it as appropriate and work with your client to come up with a solution to repair whatever damage occurred. Take responsibility, admit where you fell short, and show how you will move forward together. This transparency allows you to show your respect for your clients’ time, money, and business, and also demonstrates your respect for your relationship. You’ll find over your career that “your vibe attracts your tribe.” You’ll begin gaining clients that fit your style and that you like to work with. Especially in marketing, you want to represent companies that you believe in, so that when a friend or family member asks you for a service provider recommendation you WANT to give them your client’s information! You initially sell yourself to your client, but over time, they sell themselves right back to you. The best compliment you can pay someone is to recommend him or her to others. When your clients recommend you to their colleagues, say thank you to your existing clients and offer your best service to your new ones. Small business owners have a lot going on. One of the biggest reasons people start their own business is because of their personal lives, and the lines between their business and personal time, problems, and concerns frequently blur. There will be times that a client just wants to be heard, whether it’s regarding personal or business matters, and the best place you can be is across the table listening! Be available, be present, and listen. Lastly, take that extra moment for someone to let them know you’re thinking about them and you care about your relationship. A handwritten note is something I learned to make a habit of long ago, because it’s so touchingly personal in today’s electronic world, but even an email goes a long way towards building a deeper connection. Take a few minutes to send a Thank You note to a client, a coworker, the person you just met at a networking event, or even your mentor. Take 5 minutes on Friday afternoon to give someone a call before they leave for vacation. Remember the little (and not so little) occasions like a client or colleague’s birthday, anniversary, or child’s baseball game. These small things build lasting trust, and help transform a “good” relationship into a special one. 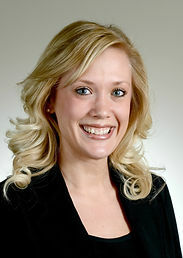 Kelsey Meyer is a HubSpot Certified Inbound Marketing Strategist atBlue Frog Marketing in Des Moines. With over 10 years experience working in small business, she delights in advising and consulting with a variety of clients and industries at Blue Frog. In Des Moines, Kelsey sits on the leadership board for genYP, Urbandale’s young professionals networking group, chairs genYP’s membership committee, and volunteers her time on the marketing board for Des Moines’ Community Youth Concepts. She is an avid runner, and also enjoys yoga and spending time with her dog. If you’re interested in getting in touch with Kelsey or learning more about Blue Frog’s services, you can reach her at Kelsey@bluefrogdm.com.